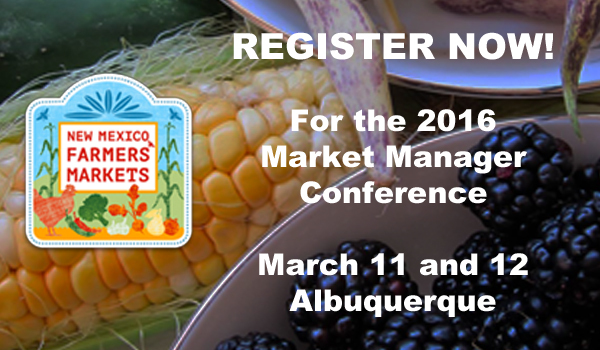 The deadline to register for the 2016 Market Manager Conference is February 26th! The conference will be held March 11 and 12. REGISTER NOW to avoid a late fee. Additional representatives will be charged $25 per person to help cover the cost of food and materials. Cost for attendees not affiliated with one of our member markets (manager, vendor, volunteer, board member, etc.) is $50. Fee includes conference attendance, meals and conference materials. 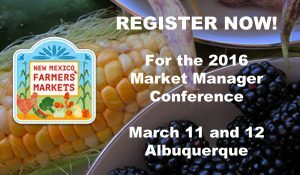 The conference will be held at Carpenter’s Union Hall, 3900 Pan American Freeway in Albuquerque. Attendees are invited to join us in the evening for a group dinner; we will make the reservations but dinner is pay-on-your-own. We have a block of rooms available at Best Western Plus Executive Suites, 4630 Pan American Fwy NE, Albuquerque, NM 87109, (505) 830-0900. Make your reservations by March 1st using this link.